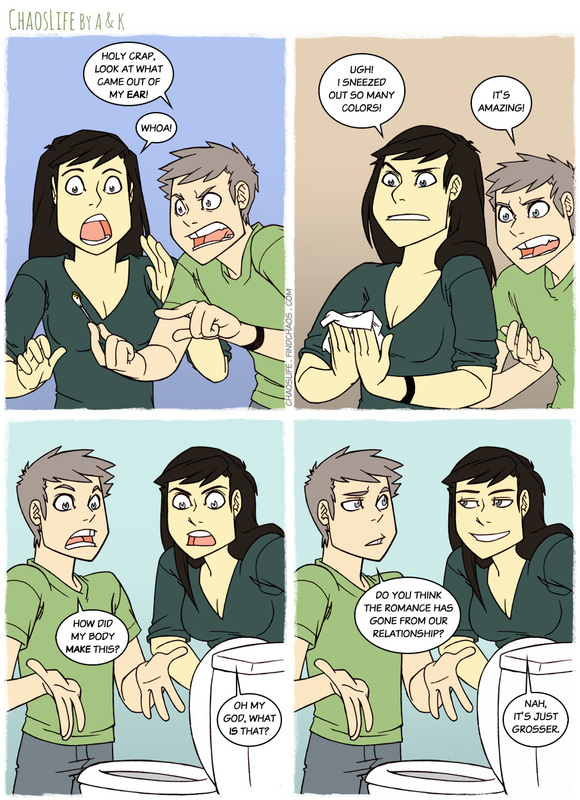 This is exactly how me and my wife are, we’re pretty gross. The danger is what makes it exciting, duh. He says it’s super relaxing like someone running their hands through your hair and I just love to pock at stuff so it’s win-win. Holy crap, you too? I do that all the time! He says he hates it, but I know better. If this isn’t love, I never wanna love again. I clean my boyfriend’s eras. And then I teel him how gross he is for having such dirty ears! It’s that or his ears smell like turpentine for days because of the drops he needs to put when they clog up, which happens every few months when I don’t clean them. Love is gross and awesome. When you find someone who can handle all the gross things your body makes, you’ve found the someone who is your wonderful other. I like to think that’s sorta part of the romance. After all, it could be worse: my husband has had to clean up my puke on a few occasions. If that isn’t love, I don’t know what is. So jealous of what you two have. It’s awesome. The moment I knew he was the one, was one day where my period blood made a batsign shape on the pad. I showed it to him all excited and he just stared….stared…and then started fanboying so hard. It was a milestone in our relationship. I don’t know if I’ve ever said this to you or not, but I’m going to say it now: you two are absolutely the most adorable couple I’ve ever seen. You really are. I really hope I have a relationship like this someday. Also – I once tilted my head and had a big ball of earwax jut roll right out of my ear and land on my shoulder. It was kind of awesome, honestly.